Climate change legislation looks dead. Can the EPA handle the job? It was always going to be tricky for Congress to pass a big climate-change bill this year. And now, post-Scott Brown, the odds are looking even bleaker. A lot of panicky Dems are blanching at the thought of another knockdown legislative brawl before the midterms, and there's even been talk of a smaller "energy-only" bill that would dish out subsidies for various technologies but wouldn't set hard limits on greenhouse gases. Cap-and-trade still has its backers in the Senate, but picking up 60 votes looks increasingly daunting. So is that it? If the Senate falters, is the country out of options for cutting carbon pollution? Not exactly. There's still the Environmental Protection Agency. Recall that, back in 2007, the Supreme Court ruled that the EPA was required to regulate greenhouse gases under the existing Clean Air Act if it found those gases posed a threat to public health and welfare (which, most scientists agree, they do). The Bush administration put off making that call, but Obama's EPA head, Lisa Jackson, went ahead last year with a formal endangerment finding. The agency is already using its power to draft new fuel-economy rules for cars and light trucks. The next step will be to start regulating stationary sources like power plants and factories, a task that's much more fraught. For a long time, no one thought it would come to this. The Clean Air Act, after all, was designed to handle conventional air pollutants like lead or sulfur-dioxide. Using it to address global warming would be clunkier than a climate bill specially crafted by Congress. If anything, the EPA option was mainly seen as a spur to stubborn lawmakers: Surely they'd work to pass their own climate legislation, so that the agency didn't have to crack down with rules that polluters were really going to hate. As Arkansas Democrat Mark Pryor put it last year, "I've always been reluctant on cap-and-trade, but [the EPA's authority] might put that in a different light." But now that climate legislation is floating in limbo, things are looking different. The EPA really might end up being the last resort for reining in greenhouse gases. Which means it’s time to ask: Can the agency actually handle the job? EPA officials have stayed fairly tight-lipped on their exact plans going forward, but here's a sketch of how many experts think the agency would go about cracking down on greenhouse gases. In March, the EPA will propose its new fuel-economy standards for cars and light trucks (the goal is an average of 35.5 miles per gallon by 2016). And as soon as that happens, the agency would be legally obligated to begin the process of regulating stationary sources, too—though the precise timeline here is still fuzzy. The first wave of regulations would involve the EPA's "Prevention of Significant Deterioration" program. Anyone who wanted to build a new power plant or factory—or upgrade an existing facility—would need to apply for a state permit and adopt "best available control technology" for greenhouse-gas emissions. The EPA hasn't specified what technologies that might entail, but it could mean anything from more efficient processes for cement kilns to forcing coal-fired plants to switch to cleaner natural gas. The appropriate technologies would be decided on a plant-by-plant basis. Since this would only apply to new plants—or plants undergoing significant upgrades—it wouldn't affect the vast majority of existing polluters. (There will also, no doubt, be messy disputes over what counts as a "significant" upgrade, a Clean Air Act battle that's been raging for decades.) Still, this first step would make a splash almost immediately. "No one in their right mind is going to propose a new coal-fired plant after this," says David Bookbinder, the Sierra Club's chief climate counsel. Now, here's where the headaches start. The EPA has proposed a "tailoring rule" to make sure that this program only applies to very large polluters emitting more than 25,000 tons of carbon-dioxide per year. That way, the regulations wouldn't affect, say, individual buildings that burn heating oil, or small businesses. But the tailoring rule is a rather significant revision to the original Clean Air Act, and the Chamber of Commerce and other industry groups are likely to challenge it in court. In essence, these groups would prefer that the EPA rules hit everyone and cause chaos, forcing the Obama administration to back off entirely. If the EPA can survive that challenge, it would then have to figure out how to regulate existing polluters. This part is crucial: The original Clean Air Act ended up grandfathering in existing coal plants, which perversely gave utilities incentives to keep their oldest and dirtiest boilers chugging along for as long as possible. The agency has a variety of options here. According to Jason Burnett, a former EPA official who helped craft greenhouse-gas rules during the Bush years, one plausible scenario would see the agency setting pollution targets for different industrial sectors under section 111 of the Clean Air Act, the "New Source Performance Standards" program. Cement kilns and nitric-acid plants would get regulated first, possibly as soon as this year. After that would come oil and gas refineries, and, later still, fossil-fuel power plants. These rules could involve anything from inflexible limits (i.e., kilns have to emit no more than a certain amount of carbon-dioxide per ton of cement produced) to a carbon-trading program, although the latter would be much dicier, legally speaking. So could all these EPA regulations actually do as much as a cap-and-trade bill to rein in greenhouse gases? Yes and no. Some environmental groups are studying whether EPA rules, if combined with an ambitious energy bill from Congress that promoted cleaner power sources and had ample incentives for efficiency, could at least help the United States achieve the near-term emission cuts by 2020 that many scientists think are necessary to stave off the worst effects of global warming. "There's a lot of low-hanging fruit that can be grabbed through efficiency and switching from coal to natural gas. A good energy bill combined with regulations might get us there," says Bookbinder. But, he cautions, the EPA alone can't bring about sweeping long-term reductions: "The only way to cut emissions 80 percent by 2050 is to put a price on carbon, and the only folks who can do that are in Congress.” After all, EPA rules are a relatively blunt instrument—having regulators suggest, for example, that polluters adopt specific technologies would constrain innovation. There's also the question of cost. EPA regulations would, in all likelihood, prove pricier for polluters than a flexible cap-and-trade system from Congress. For a utility that owns a lot of creaky old coal-fired plants, it may be cheaper just to pay $12 per ton of carbon-dioxide under cap-and-trade—or to lobby Congress for free permits—than to implement millions of dollars worth of equipment upgrades per an EPA mandate. That's why most industry groups would prefer that Congress come up with its own system. Another problem with going the EPA route is that there are plenty of legal uncertainties involved. Industry groups are certain to sue the agency at every turn, which could bog down the regulatory process. Still, say some experts, as long as the agency takes care in drafting its rules, it can probably survive the flurry of legal challenges. "The EPA has a good track record here," says Burnett. "Even during the last eight years, the record wasn't always stellar, but the courts still upheld most of the agency's rules. 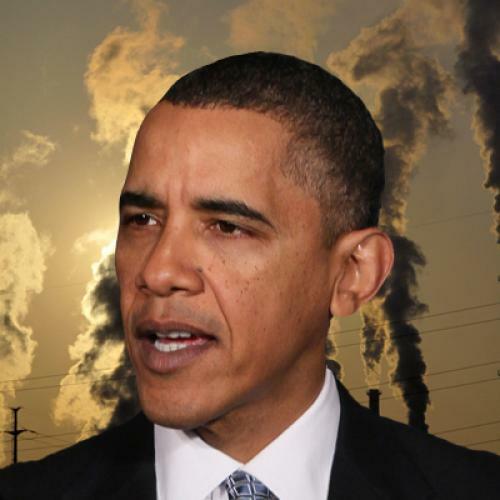 That's something within EPA's control: They can decide how much legal risk they want to take." Lawsuits might be able to slow down the EPA for a few years, but probably not much more than that. The biggest potential sticking point with the EPA approach is that Congress can always put a stop to it, if it chooses. In the Senate, Alaska Republican Lisa Murkowski has put forward a bill that would strip the agency of its authority over greenhouse gases, and she has the support of 36 Republicans and three conservative Democrats. That's clearly not enough to enact a law (let alone overcome an Obama veto), but things could change if the GOP picks up more seats this fall. Alternatively, Congress could block the EPA from getting the funds it needs to regulate greenhouse gases (Obama asked for about $43 million in his latest budget). "That's the problem with this notion that the EPA is somehow holding a gun to Congress's head, forcing us to pass legislation," says one Democratic Senate aide. "Because the first thing that occurs to people here is, 'Hey, I know a way to get out of that.' "
That means that, in the coming months, many climate advocates may have to shift gears. Instead of talking about the EPA's authority as some terrifying prospect that only the passage of a cap-and-trade bill can stop, the EPA option could increasingly get framed as something worth defending in its own right. Especially since it may be one of the few viable options left for tackling climate change. Bradford Plumer is assistant editor of The New Republic.